Upon waking up today, I saw a friend’s status on Facebook: “To the 2 strangers I called last night, and have no recollection of what we talked about, I am very sorry.” Now I don’t know what that was about, but it reminded me of so many incidents wherein people got so wasted that they had no recollection of the events of the previous night. I am sure that you are no stranger to such events as well, and that, in the morning, you wished that there was a way to undo things. But wait – there is an app for that! At least for deleting written evidence. Developed by So Soho Holdings Limited and 22seeds, the iPhone app is being dubbed as “the world’s first morning-after app” and seems to hold some potential. The idea is rather simple: once you wake up from your drunken stupor and realize that you have posted some things on Facebook and Twitter that you would rather not have posted, you can launch the app and delete those posts. Oh, and you can delete photos as well. 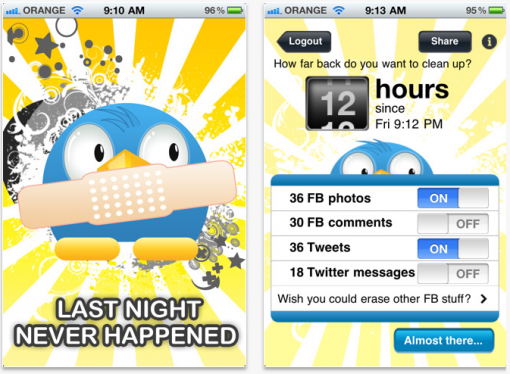 If you are ALWAYS in control when it comes to your social network accounts, then forget the app. Then again, I have a strong feeling that you will find this app very handy. Get it from the iTunes store for $1.99.